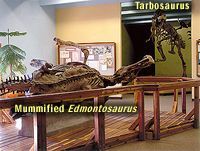 In keeping with its theme of "Global Dinosaurs," the museum exhibits the Herrerasaurus from Argentina and the Plateosaurus from Germany. Herrerasaurus, from the Triassic of Argentina, was one of the earliest of the theropod dinosaurs. Recent discoveries by expeditions to Argentina led by Paleontologist Paul Sereno have uncovered the remains of several specimens which made this skeletal reconstruction possible. Plateosaurus was one of the earliest of dinosaurs to have had a worldwide distribution in the Triassic Period. It is ancestral to the long necked gigantic sauropods which dominated the world during the Jurassic. 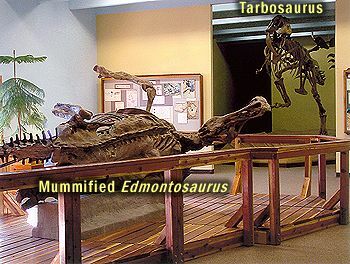 Several skeletons of Tarbosaurus have been found in Mongolia. Tarbosaurus is closely related to the more familiar Tyrannosaurus rex of North America. This rare duckbilled dinosaur mummy was discovered in 1910 in Wyoming. It is one of two collected by the famous Sternberg family. There is a large patch of skin from the side of the animal with more on the neck, along the backbone, and on both hands. The skeleton is not crushed, but preserved naturally in the round. The original fossil is in the collection of the Senckenberg Museum in Germany. This is one of only two casts on public view in the world.